Zoe Berman. is a junior at Skidmore College, double-majoring in Psychology and Studio Art. At Skidmore, she is a member of an all-female a cappella group called "The Accents" and a found-object percussion group called "PULSE." 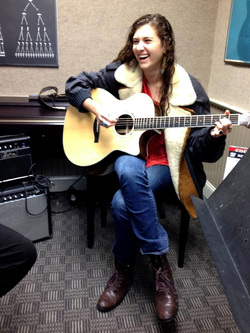 She has been an avid musician and singer-songwriter for several years, performing in various local establishments. She primarily plays indie folk music, but also dabbles in a variety of genres.